Cleaning your gutters during the winter season is just as important in the winter as it is in the summer if not more so. The backup usually found in clogged gutters during other seasons can freeze and create an even bigger problem. Clogged gutters can also lead to ice dams, the weight from these ice dams can lead to your gutters separating from the rest of the house. Once debris freeze inside your gutter during winter, the drainage speed of your gutter will be slower even when the temperature rise above freezing. Loose gutters usually lead to rotting of the wood. Ideally you should clean your gutters in the fall before the winter season arrives but if you haven’t done it, don’t despair, it can still be done in the winter. Always inspect the seams. Make sure there are no visible leaks or apparent gaps between the fascia and the gutter. While at it, ensure that there’s no visible rotting or other water related damage. If you do note any damage, be sure to do the needful repairs. Also check if water is pooling. Water should always be redirected on a downward slope. If you note any seepage, you may want to track down where it’s coming from. Many people have now adapted to having snow guards installed to ensure that ice is broken down before it slides down their gutter, the alternative might bring your gutters down. 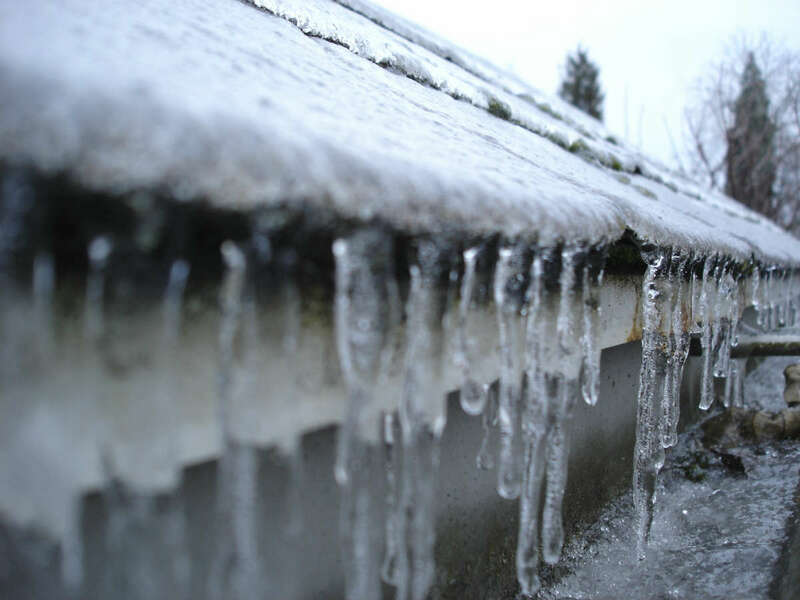 However if you have ice dams in your gutter, it is best to call for professional care. Ice dams can be prevented by having good roof ventilation and insulation. Some people install heating cables that run along the edge, this helps in preventing ice fills. If you note that you have mold on your walls and/or rotten debris present in your gutters, this could bring about insects and crawling animals which could lead to illness in the home. People living in old houses might have to think about changing their whole guttering system as they might be less effective due to wear and tear. This also increases their chances of having leaks in certain worn out areas of the entire system. When cleaning your gutters always ensure that you’re safe. Walking on the roof of your home when you have a frozen gutter may not be the best idea as it can easily separate from the house with you on it. Always use a ladder when attending to your gutter. Ensure you wear rubber-soled shoes when using a ladder. When dealing with complicated problems, always ensure that you seek professional help. However it is always advisable to have your gutters checked before the winter. Make sure you remove all the leaves, twigs etc. that you can in the fall before winter arrives and freezes it up. As always, if you aren’t up to doing the job yourself, let the pro’s from We Get Gutters Clean™ help you out. Click Here for a free online quote. Next: Next post: What Happens if You Don’t Clean Your Dirty Gutters?